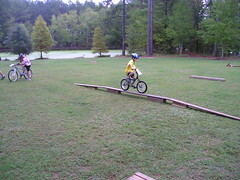 October 4 is this year’s IMBA International Take a Kid Mountain Biking Day. 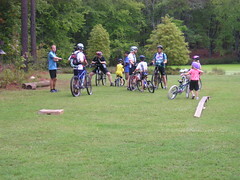 We had a lot of fun at this last year (my attempting to learn how to “pedal surge” to make it over large logs and instead flipping my bike over and landing on my back notwithstanding) when the local event was held down at Harris Lake park. 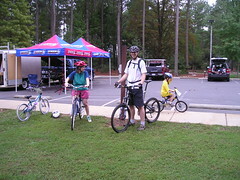 This year the local event will be held at Lake Crabtree County Park in conjuction with the Triangle Fat Tire Festival. 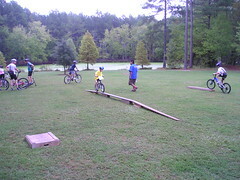 It is being put on by TORC and Trips For Kids Triangle. I’m not sure yet if I’ll be helping out as a member of the mountain bike patrol but at the very least my son and I plan to be there for the event and if you have kids too I’d recommend you bring them out! Following up on the previous planning meeting for designing the pedestrian bridge over I-40 for the American Tobacco Trail, it looks like there will be a new meeting on April 29 at 7pm in the 1st floor City Council Chambers at City Hall in Durham. This is to discuss the concepts for the pedestrian bridge over I-40 for American Tobacco Trail – Phase E that will also include paving the ATT all the way to the Chatham county border. I rode my bike from south Durham up to the first meeting and depending on my schedule I hope to go to this upcoming meeting. I really want to see this bridge built as I think it will be very good for promoting bicycle and pedestrian travel between downtown and southern Durham. There were quite a few people at the last meeting and I hope more people come to this one so that we show city leaders that this is an important project.